Commuting to campus by bike is becoming an increasingly popular option at WSU as we continuously strive to offer attractive, safe, and enjoyable biking amenities on campus. In partnership with University Recreation, we now offer a Bike Commuter Locker Membership program for bike commuters wishing to use shower facilities when they arrive on campus. Click here to learn more about the program. 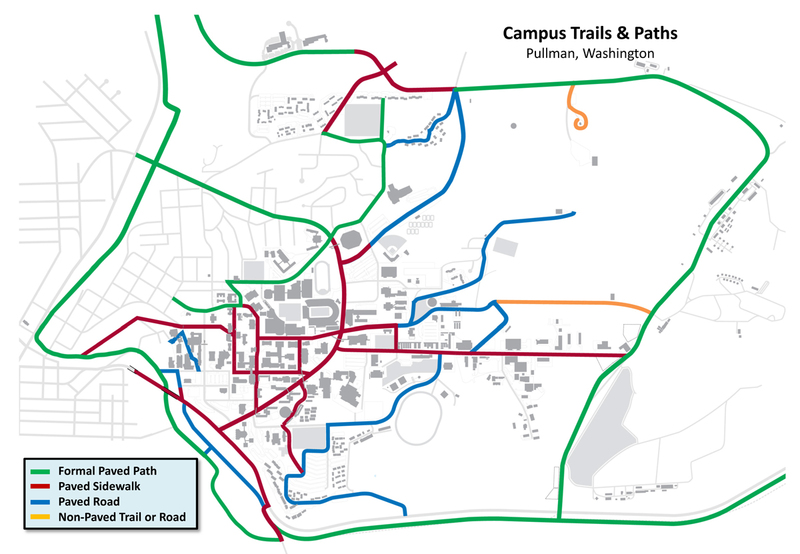 Check out our Campus Trails and Paths Map for a graphic of our trails and paths popular for bike-riders as well as pedestrians. Also, covered and uncovered bike racks are offered all around campus near building entrances and offer bike-riders a safe place to lock up their bike during the work day. Walking is a healthy, enjoyable, and environmentally-friendly alternative to driving to campus, and WSU-Pullman is committed to providing staff, faculty and students safe and enjoyable pedestrian options and infrastructure. While the city of Pullman lies on a series of hills, it is also just a few miles in diameter, making walking to campus a viable option during good-weather conditions for those who live in Pullman. If you need a campus map or wayfinding assistance for your walking commute contact Transportation Services! The Outdoor Recreation Center (ORC) also offers a Bike Share program that allows WSU employees and students to rent a bike for a few hours at a time. Contact the ORC for more information regarding the bike share program! Click here to view the WSU Bike and Pedestrian Plan!